The relationship between Turkey and the Kurdistan Regional Government (KRG), which has been growing for years, is now close to being extended in various areas. After Prime Minister Ahmet Davutoğlu's visit to Irbil in November, KRG Prime Minister Nechirvan Barzani visited Turkey and met with Davutoğlu and President Recep Tayyip Erdoğan. 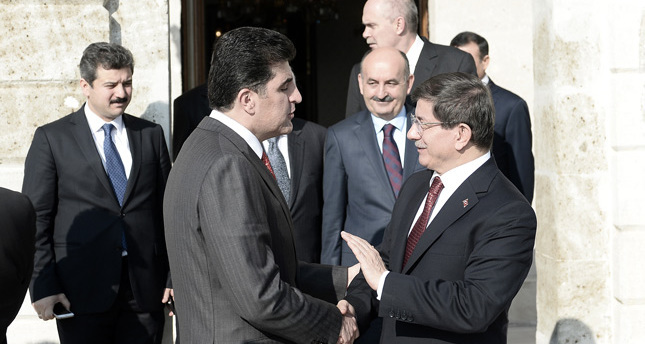 After a one-and-half hour meeting with Davutoğlu in Istanbul, Barzani went to Ankara and was received by Erdoğan. According to sources in Ankara, ongoing cooperation concerning the common threat of the Islamic State of Iraq and al-Sham (ISIS), energy issues, the training of KRG peshmerga forces, cooperation in the field of humanitarian aid for internally displaced people who fled from ISIS and other regional developments were the main items discussed. Due to the ISIS threat, Turkey launched a training program for KRG peshmerga forces in recent months and Foreign Ministry officials announced that 230 peshmerga soldiers had been trained by Turkish Special Forces, known as the "maroon berets." During the meetings, the Turkish and Kurdish prime ministers agreed that the training program would continue for as long as necessary. In early December, Bagdad and Irbil reached an oil agreement. The agreement is considered the gateway to achieving comprehensive Iraqi reconciliation, but sources have said that the agreement still faces many obstacles and therefore, Turkish and Kurdish parties discussed possible ways to solve these obstacles and Turkey's role as mediator between Irbil and Baghdad. Extending energy cooperation between Turkey and the KRG was also one of the main items on the agenda. Last year, the KRG and Ankara finalized a comprehensive package of deals to build multi-billion dollar oil and gas pipelines to ship the autonomous region's rich hydrocarbon reserves to world markets. Currently, around 400,000 barrels per day (bpd) of Kurdish-produced oil is pumped to the Turkish port of Ceyhan, and the KRG wants to increase that volume to 500,000 bpd by the start of 2015 and up to 800,000 barrels by the end of 2015. In addition to oil, carrying Kurdish gas to the Turkish market, which was to start by 2018, was also discussed during the meetings. As part of the plan, 20 billion cubic meters of Kurdish gas, which will make up 30 percent of Turkey's gas consumption, is to be carried to the Turkish market by 2025. There was no press statement regarding the meetings and after the completion of the talks Barzani left Ankara. Meanwhile, Iraqi Prime Minister Haider al-Abadi will follow Barzani and pay a visit to Turkey on Dec. 25-26 to participate in a meeting of the High-Level Cooperation Council between the two countries' cabinets.